Since 2012, Holly Francesca has created colourful and unique illustrations based on the most iconic places in London, the UK and the World. Our work is as much about the research as it is about creating the illustrations. We look for all the things that truly make a place special, no matter how quirky, so people can look at the designs and keep coming back to notice more. Since our first art print, a Map of Kew Gardens, the collection has grown lots. Inspired by living in London, we have done a number of different local area designs. We have also been inspired by travel and have had a great time learning much about other parts of the UK and the world as we have researched and designed many other places and collections. From original hand drawings, our illustrations go on to brighten up many products for your home; including greeting cards, art prints, tea towels, tote bags and umbrellas. As well as the core range, we offer personalisations, bespoke commissions, corporate work and collaborations. We continue to add more designs all the time, so keep checking back or join my mailing list to hear more as it happens. Who is Holly Francesca then? 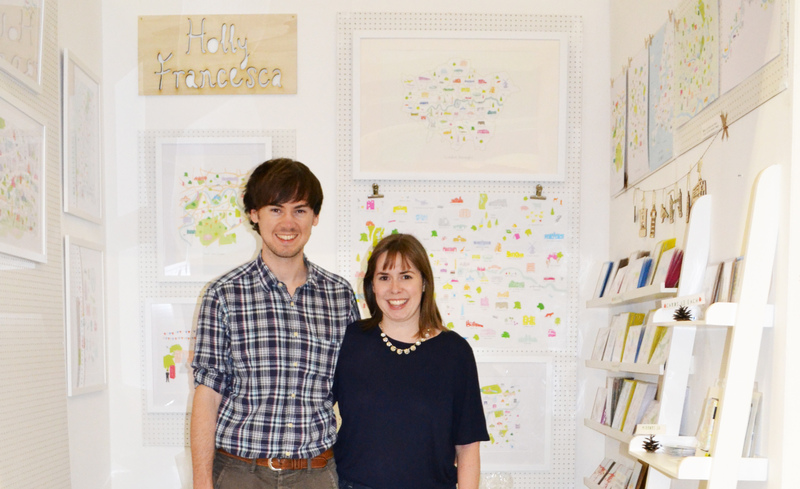 Holly grew up in North London with a passion for all things creative. This passion continued onto the university years, where after studying BA Applied Arts she graduated in 2009. Over the next few years, Holly kept making and designing. In the early business, Holly put her craft skills to good use with much screen-printing, bespoke light creation and painting. Then in her quest to use as many colours as possible, the need to use commercial printing started, in turn giving Holly more time to do what she is best at, drawing! Elliot also completed his degree at the University of Hertfordshire and this is where the two of them met. With Elliot coming at things from a business side, the two of them felt it would be the perfect partnership. From his skills learnt working in advertising, Elliot handles the business side of things but also loves to get involved with researching landmarks for the next designs. Holly creates hand drawn, colourful illustrations using her signature bright colour palette and contemporary style. Our aim is to give people something truly unique and something special that it almost feels as though it has been commissioned especially for them. We want to make products are of the highest quality. We work with some of the best and most trusted UK suppliers, who share the same emphasis on quality.